I know Kacey from Doodle Bug’s Teaching is taking a break…but I’m in such a good habit that I couldn’t let a week go by without doing a Five for Friday. So our elf this week hid candy canes around the room for the kids to find. So, two of my girls decided to make a comic about it during Writing Station. They called it Candy Cane Coincidences. I love how they connected events in the classroom and used it for their writing. This is our parent gift. Yes, it is cute. No, it was not easy to make. Yes, in theory, it was supposed to be easy. However, problem 1 – the plastic ornaments from Amazon came and many were cracked. And some were so badly cracked we couldn’t use them. Problem 2 – the whole they snap together easily thing was not true…not true at all. The frustration that mounted after having them pop open multiple times and brown paper fall on me was too much to handle lol. So, yes they did turn out cute. But, not as student friendly for making as I had hoped. What do you do for your student gifts for parents? Oh is this true! We start break at noon today…and I’m counting the hours. And, I’m sorry for those of you that still have to go next week. I can’t imagine…. Last weekend my parents came to visit! It was great catching up and hanging out with them. We checked out the beautiful Bellagio Christmas display and went to the Michael Jackson One show – which is amazing! It was my second time seeing it and I could already go again! Snowy, our class elf, was back for week 2 and he had some more adventures in our classroom. To see our first week with Snowy, click here. Snowy decided to help us out today because he felt bad for eating the candy canes on Friday. He wrote our class schedule for us! Looked a little different than a regular Monday in 2nd grade. Snowy was a little offended that some of the kids thought he had misspelled a word or two on his schedule from Monday. So, he decided to work on his spelling with our spelling list. He also decided to add an important word to it – Snowy. Snowy had a great seat today in the back of the room with Santa and friends. He also decided to show us his decorations he created for our room. He loves his name a lot and wanted the kids to get lots of practice with the spelling word he added the day before – his name – Snowy. In Snowy’s letter, he asked us to focus on being kind and do good deeds. He wanted everyone to do one or more nice things and write him a little note letting them know what they had done. Well unfortunately, no one wrote Snowy a note about a good deed that had been done. So, Snowy decided to try again. Today he sat over by the bucket filling area as a way to remind everyone to be kind. Again, he asked the kids to each do at least one kind thing or more and write him about it. Snowy had much better results! Here are the notes of kindness and some questions for Snowy at the end of the day! The kids were all impressed with how Snowy sat in the bucket. We decided he must be very flexible lol. Poor Snowy the elf got sick. He picked up the cold that many of us in class had. He decided to spend the day resting and was all cuddled up with a tissue blanket and many… (hopefully not used) tissues around him. Check back next weekend to see what Snowy was up to during the final week in our classroom! The elf is back! This year we decided to start our elf adventures on December 1! I’ll write each Saturday and give you a little update on what our guy has been up to. Our elf made quite the entrance zip lining in our classroom. He apparently is a bit of a daredevil. Our elf brought us the book The Elf on the Shelf to read as a class and left us a note from Santa. After reading the book, we needed to name our elf. After a few different rounds of voting we settled on Snowy the Elf. Each day we fill out our Elf Watch Journal. I got this from Sunny Days in Second Grade’s store on her blog. On Day 2, Snowy got into a little trouble. We’ve been using candy canes for a science experiment and I and the class specifically told him yesterday to leave the candy canes alone. Well….apparently…Snowy isn’t the best listener. The kids couldn’t believe he got into the candy canes and started eating them. Snowy also left us a note. Some of the kids left him notes the previous day and he responded to a few of their questions. Love the ending to this kiddo’s journal – We need those candy canes for our experiment Snowy. Too cute! How is it December??? November seemed to fly by and that Thanksgiving break definitely flew by! 10 days went by in a second! I’m linking back up with Doodle Bugs Teaching to show you what we’ve been up to this week for Five for Friday. In Writing Workshop, we are working our informational unit and writing like scientists. I love the lab report format WW uses and wanted to add in a holiday-ish themed experiment. I found the Candy Cane Experiment from Lemon Lime Adventures. It is awesome! Fun, easy, and not too messy! This week we tried out the candy cane in cold water and hot water. Next week, we’ll do the final experiment and try it in vinegar. I’ll follow up with a blog post next week with some of the lab report results. The kids are loving it and their reflections and observations are getting better each time. Love, love, love my room moms. They always outdo themselves with cute decorations! He’s baaaaccckkkkk. Yesterday I started Elf on the Shelf in the classroom. Stay tuned for my blog post tomorrow discussing his first two days of adventures! It’s my favorite time of the year…the holiday season. These are two pictures from Thanksgiving break and since I took a little break from blogging last week, I wanted to share them with you today. This was my first time ever making Thanksgiving dinner and I have to say it turned out pretty well! No major kitchen mishaps and my husband had a very full plate so he was a happy camper! I also decorated our Christmas tree! Love having all of the holiday decor up in the house. Today was our first day back and during Morning Meeting we came up with resolutions for 2016. We first read the cute story Squirrel’s New Year’s Resolution. I like this story because it explains what a resolution is in kid friendly language and gives some good examples. Then, we discussed resolutions as a class and kids shared some ideas for their resolution. We talked about sentence starters like – “My goal is….” and “I resolve to…” After they wrote their resolution, they put it up on the chart that will be displayed in our classroom. Read at least one chapter book a week. I’m so proud of her coming up with this one since she tends to stick with picture books, but she’s definitely very capable of reading chapter books. My goal is to get as many AR awards – this kids on a roll with them already! I resolve to make friends everywhere. Love this one! Do you use resolutions in the classroom? What are some your students have come up with? We had our holiday party at school on Friday. Each year we read the Polar Express, complete some activities with it, and then watch the movie at our party. Here are some pictures from our half day full of fun holiday activities! Santa came to our assembly and read “Twas the Night Before Christmas.” He also greeted each child and gave them a candy cane. They loved it! My room mom got everyone a pillow with their name on it. Kids wore their PJs to school, brought a blanket, and use the pillow also to snuggle with during the movie. This mom is so creative! Love the Christmas tree of fruit! Can’t resist some yummy Christmas Krispy Kremes! My class was very generous and presented me with a class gift – a wreath full of gift cards. I’m very grateful to work at a school with very generous families! They loved it! They were so excited to hang out and watch the movie together! Hope everyone else had a great last day and if you have a few more left…you’re almost there! Buddy decided he also wanted a chance to be Star Student, so he made his own poster. He even positioned himself in front of a star which my students thought was pretty awesome. Buddy reminded us today that helping and being kind is a big part of the holiday season. He focused on us filling others buckets. Buddy helped “decorate” again today. The kids thought the toilet paper was hilarious. They especially liked that he was wearing the roll on his head. Since the previous day had been rough with listening, Buddy spelled out a few reminders for them to help them throughout the last full day of school. Semi-helped lol. On our last day with Buddy, he helped decorate again. My room mom had put penguin decorations with each child’s picture in the penguin head. Buddy decided he wanted to join in! 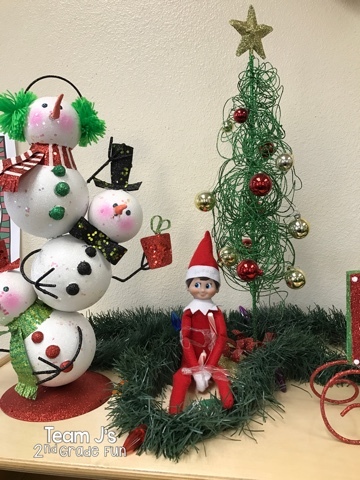 Hope you enjoyed checking out what our elf has been up to! Here’s what our classroom elf, Buddy has been up during Week #2 in our classroom. He’s quite the crazy elf! The kids were happy to see that Buddy’s leg had healed from last week. Today he was taking it easy and reading a holiday book. Note to Buddy- don’t sit yourself near our small group table. Buddy’s chair got bumped a few times and while Buddy kinda fell to the side he picked himself back up when we were out of the room. Since Buddy was too close to kids and tables he decided to be up high on Day #7 and out of the way – hanging out in one of our snowflake decorations. The class has been rather loud – especially at transitions, unpacking in the morning, and packing up at the end of the day. Buddy decided to leave them a little visual reminder to be quiet. Our classroom has been beautifully decorated by our room moms, but Buddy wanted to join in on the fun. He decided to add a post-it note tree to our decor! Unfortunately since I was out some of this week, I didn’t get a picture of Buddy in action. On Day #10, Buddy got a little hungry after his journey to the North Pole. He helped himself to some of our snacks in the room. Do you do Elf on the Shelf or Elf in the Classroom? Would love to hear what other elves have been up to! The kids were so excited to come back from Thanksgiving break and see the elf ziplining in the classroom. We read the letter that I found in The Primary Journey’s TPT Store. It’s a great intro letter that gets the kids excited about reading the book. Then, we read the book that came along with our elf. After reading the book, we came up with a list of possible names and voted. Buddy ended up winning! After picking Buddy as our name, I introduced the packets from Sunny Day’s Elf Classroom Resources. It’s a fun way to incorporate writing every day by having the kids write down about the elf’s adventures. Day 3 – Buddy fell trying to climb down the tower and hurt his leg. Mrs. Claus bandaged him up so he’ll eventually be good as new. The kids were so worried about his leg! Our elf on Day #4 tried to be helpful by writing our schedule for the day, however his schedule was different than what I had in mind. The kids loved it and wished we could’ve done all of the activities. Too bad there isn’t snow in Las Vegas! As the week’s gone on, the behavior has gotten a little crazier. I’m sure I’m not the only teacher to say that. Today Buddy was trying to remind everyone about the Clip Chart and hoped that they would join him up on purple on his very own clip! I am in love with Elf on the Shelf. The school I’m at is huge into holidays and all 3 second grade classes have an elf. My kids are loving it, I’m loving it, and it’s helping keep behavior contained in this crazy month of December. Here’s what our elf, named Sparky has been up to. The kids decided that on Day #1 he had bungee jumped from above the white board. They like that our guy is a bit of a daredevil. We also voted on names and decided to call him Sparky. I’m an ASU Alum and a few of my student’s parents are too. I got this cute introduction letter from the Primary Journey on TPT. The next day he created a tower out of snap cubes and decided to climb it. He also left us a note and a mess at the bottom. The kids loved this one! I saw this idea on Pinterest. Sparky decided that he loved his name so much he wanted to decorate the room with it. My kids loved it and thought he put graffiti on the wall! Each day my students are filling out their Elf Investigation Log that I got out of Sunny Days in 2nd Grade’s Elf Classroom Resources. You can find that on TPT here. Does your class have an Elf on the Shelf? What has your elf been up to? Comment below.